Simple tips show how to easily tell what key you’re in with this instant ebook. The next time someone asks, “What’s the key?” you won’t be embarrassed because you’ll be understanding keys and key signatures and you’ll know what to say. Singers and other musicians can learn the tricks to hear what key you’re in and recognize key signatures. 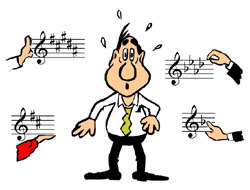 Learn how accidentals, sharps, flats and naturals create the different musical scales. These tutorials, resources, methods, systems of music instruction and reading music help you to identify key signatures and understand what is a key. See also: aural key identification, how to know what key you’re in, identifying the key, tonality, key signatures, keys, learning key signatures, modulations, musical key recognition, reading key signatures, sheet music, songs, studying music, transpositions, aural, visual, what is the key, finding your singing key, how to tell the key of music, and what key do you sing in? If You're in a Hurry, Try These Free Shortcuts. 1) BY EAR, the quick trick is to listen to the very last note you just sang of the song, and go to a keyboard and find that same note. That is usually the key. 2) BY SIGHT, (if you’re using the sheet music) the quick trick is to look at the first chord of the song (“Bb” or “Em” [E minor] ) printed above the music. That’s usually the key of the song. For the COMPLETE information On This Subject, Order the HOW TO TELL THE KEY IN MUSIC BY EAR OR BY SIGHT ebook for just $8! 14 Easy Steps Teaches You What Professionals Know. Professional musicians can tell the key of a song or composition by ear and by sight. This ebook will teach you both. At first, it’s easier to tell the key by ear than by sight. The information is presented in a step-by-step sequence and should be learned in that order. In order to make this helpful to everyone, we’ve tried to clarify even the simplest of concepts, to allow for complete beginners to understand. To succeed at “hearing” the key, fewer steps are requred, so you will be able to easily do this by the time you reach step 7. However, there are additional points to be understood in order to succeed at “seeing” the key, in step 13. The reason the steps are presented in this manner is because, you may only need the information up to being able to tell the key by ear. If this is the case, there would be no reason for you to go past step 7. How to recognize keys by ear. How to recognize keys by sight. How to recognize sharp key signatures. How to recognize flat key signatures. How to recognize major key signatures. How to recognize minor key signatures. You Don’t Have to Know How to Read Music! This ebook recommends 14 specific steps to learn in an exact sequence. Try to master each step before going on to the next. Mastery of each step will occur somewhere between one day and one month. This ebook is simply a web page that you may view on your own computer or print out. You do not need to be connected to the internet to view this ebook. It is compatible with both PC and MAC computers. It is a one-page web page, which will become approximately 12 pages when printed out on the average printer. There is nothing else involved for you to do. There are no special viewers or readers required or any special software for you to install. In some cases a browser “plug-in” such as RealAudio or Macromedia Flash will be necessary to access the multimedia components of this ebook. Never Feel “Dumb” Or Inadequate Again! There is no longer any reason to have fear when the subject of “keys” comes up. Now you will be able to speak intelligently, without hesitation. How to Tell the Key in Music by Ear or by Sight is guaranteed to help you feel comfortable with this subject. Order Your Instant ebook for $8.00 Now. Available INSTANTLY as an ebook only from us! Get the complete information to learn how to easily tell what key you’re in RIGHT NOW. The cost is just $8.00 that you charge to your credit card or PayPal account. Pay NO SHIPPING and NO SALES TAX! You will gain immediate access to the ebook. The PC version will automatically un-compress after downloading without any special “unzipping” software. The MAC version will require Allume’s Stuffit Expander, but this most likely is already installed on your computer. Howard Richman has been teaching piano since 1972 and often works with singers. He has pioneered innovative teaching strategies in the fields of music education and stress-management since 1976. Mr. Richman is the author of the popular book, Super Sight-Reading Secrets. He has a B.A. from UCLA in piano performance and an M.F.A. (Master Fine Arts) degree from California Institute of the Arts, where he also taught on the faculty for three years. Mr. Richman’s specialty is to help people break through their most stubborn blocks. If you’re looking for some of the supplementary sight-reading books recommended in Super Sight-Reading Secrets, here is most updated listing and how to buy them.